Westgate was contacted recently by a manufacturing company in the North of England, which has a long and successful history specialising in a very diverse mix of colour concentrates, compounding technologies and additives. The company had two related requests for Westgate. Firstly, they would need to enclose a mezzanine floor in order to prevent product dust from spreading across the manufacturing plant. Secondly, they needed to place curtains across bays, again in order to prevent dust from escaping to other areas of the building, when processes that inevitably result in the generation of dust are taking place. Westgate was able to make use of their experience and variety of industry leading products during the course of this particular job. 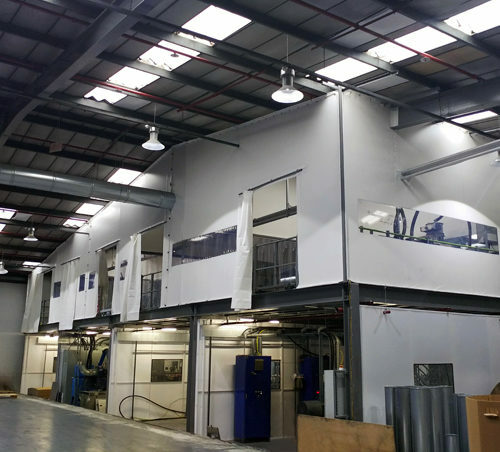 Flexiwall was used to enclose the mezzanine floor; the area had a variety of services and ducts around it, and Flexiwall is perfect when it comes to finding a solution that can install around penetrations such as these, while still maintaining a tight seal. This seal is almost 100 percent effective when it comes to preventing dust from escaping the area. There are a couple of other advantages that come with making use of Flexiwall; it is very light in terms of weight; it takes up very little in the way of floor space, once installed. These advantages were of a particularly beneficial nature in this scenario, due to the fact that it was a mezzanine floor. The final Flexiwall solution was 23.5 metres in length and 5.5 metres in height. 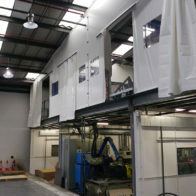 Westgate also installed a number of visions panels within the final Flexiwall solution to ensure that the maximum amount of light could still enter the mezzanine area. Westgate also made use of a second of their popular product range, Flexicurtain; in total 14 retractable curtain walls were used. 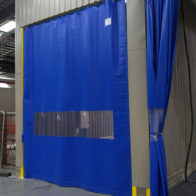 The curtains were then installed with the use of standard design concepts and materials, so as to create a number of temporary cost effective barriers, which are successfully able to prevent dust escaping as and when various processes are in operation. One of the many things that Westgate prides itself on is being able to perform a quality job in as speedy a fashion as possible, so as to ensure complete satisfaction from all of our customers. The complete timescale for this particular job was no more than three months from the delivery of the initial estimate, to the completion of the installation. Though the physical installation only took two weeks in total.